Please refer to our stock # T-23 when inquiring. 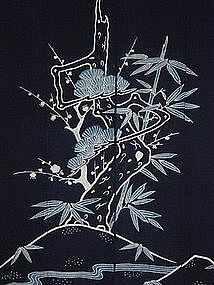 Meiji Era futon-ji; indigo dyed cotton with tsutsugaki (free-hand drawn resist) image of the Three Friends of Winter: Pine, Bamboo, and Plum. L.150cm(59") x W.128cm(50"). Such bedding covers were given as part of a bride's dowry, commissioned with auspicious images or a family crest by the bride's family. This theme of Pine, Bamboo, and Plum was especially auspicous for a newly married couple, with each element having its own characteristic way of overcoming hardship (the cold winter.) The free-hand resist drawn with a "tsutsu" (much like a pastry cone) creates a much more lively image than can be attained by stencil dyeing.